Wisconsin Pump & Sump was founded in 1985 by Wayne K. Jeske. Wayne had worked at Catapillar for decades before the corporation left Milwaukee in the early 1980's. Wayne was joined by his longtime friend Dan Hilgart in 1988. Dan’s family has been putting in septic systems in the Ozaukee County area since the 1960’s. Dan grew up carrying drain tile and driving dump truck for his fathers septic installation business in the 1970’s. The opportunity to get into the service end of the septic business was a perfect fit as this allowed Dan to service many of the systems his family installed. The business took off through hard work and some well timed advertising. 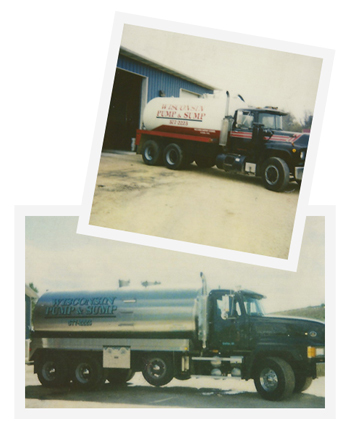 As a team, Wayne and Dan built Wisconsin Pump & Sump into one of the largest liquid waste carriers in Ozaukee County. In 1997, Dan Jr. (D.J.) started as a septage operator. Soon after D.J. became a POWTS Inspector, allowing the company to perform real estate inspections. Wayne retired from the business in 2002 at the age of 60. Since Wayne’s retirement, the business has continued to prosper though hard work and education. In the spring of 2013 we look forward to welcoming Dan’s grandson, Justen, as a septage operator, making 3 generations working with Wisconsin Pump & Sump. Justen enters the business as a young driver and operator, but has been in a truck since he was 4 year old riding with grandpa and his godfather. His knowledge of our operations and the many local septic systems he has helped service give us great confidence in our newest operator.